Fans of other universities' sports teams often come to the Free Expression Tunnel before and sometimes after big athletic events to paint the tunnel with their teams' athletic colors as part of a prank. Carolina Tar Heel fans have a long history of doing this prank as well as fans from East Carolina University. The tunnel is subject to flooding during massive torrential rains. Waters rose to a height of 60 inches after a storm in July 2003. 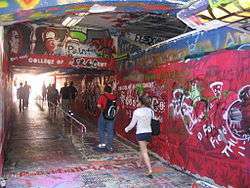 For the Spring 2005-2006 semester, the Free Expression Tunnel was closed for repairs and the installation of handicap ramps. The tunnel reopened in the winter of 2006 with a re-dedication ceremony, which unveiled a new plaque at the tunnel's north entrance expressing the brief history of the tunnel and its purpose. Prior to the renovations, the space available for free expression was much larger at both ends. On November 5, 2008 racist, threatening graffiti directed at (then) President-elect Barack Obama was found in the tunnel. Because of the threats against Obama, the Secret Service was among those called to investigate. The four students responsible were identified, and admitted to the act, stating that it was protected by their First Amendment right to free speech; however the North Carolina chapter of the NAACP has called for their expulsion. Since February 2010, there has been an ongoing tradition of a weekly freestyle cypher, every Monday night around 11pm. Local artists and students alike gather at the tunnel to freestyle, beatbox, sing, play instruments, recite poetry, and network. The video below is an example of what people can do in the tunnel.